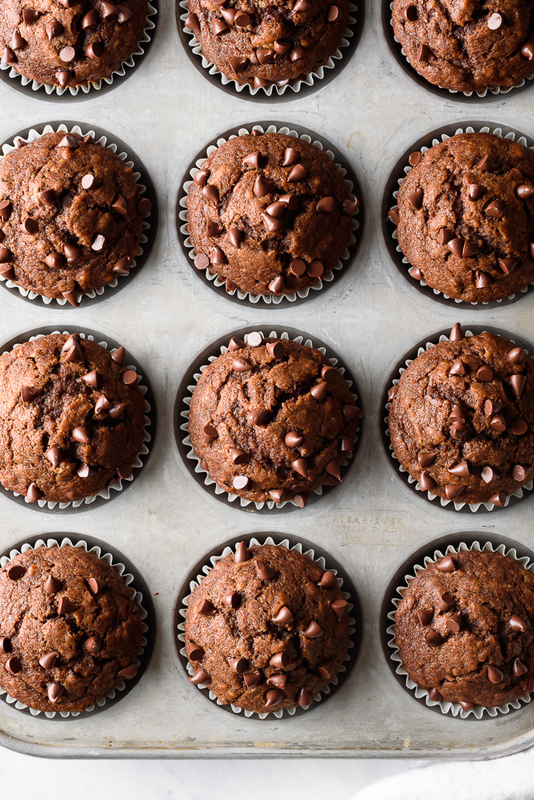 These easy bakery style dark chocolate pumpkin muffins are tender and flavorful, and come together in just one bowl – no mixer required – for the perfect deliciously spiced Fall breakfast treat! Trick question. I actually love love love pumpkin all year round. It’s a magical ingredient to bake with, keeping things – especially cakes and quick breads – incredibly moist and tender while packing tons of cozy flavor. For as long as I can remember, my mom has baked incredible pumpkin bread around the holidays. It’s really more cake than bread, rich and dense, and sweet, and generously spiced, and something we all look forward to every year. It’s so good, in fact, she won’t let me share the recipe with you. She barely shares it with me! But she also mails me loaves of it when I’m far from home, so I will not complain, lest that delicious pumpkin train come grinding to a halt. So, while the pumpkin spice trend may be a tad bit out of control (pumpkin spice kale chips, anyone? ), there’s no shame in my pumpkin game, and I’m baking with winter squash all season long, starting with these double dark chocolate pumpkin muffins. 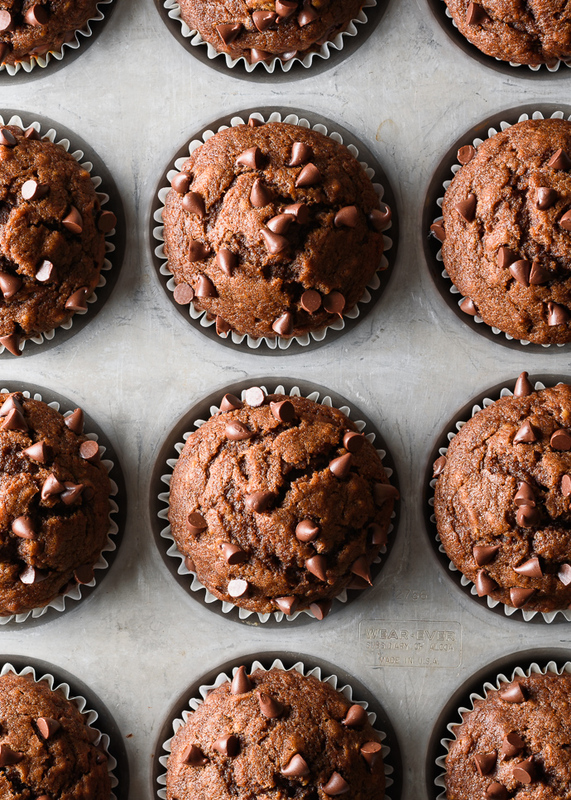 These chocolate pumpkin muffins are all about the sneaky veggies, hiding in plain sight under the guise of deep, dark chocolate indulgence. 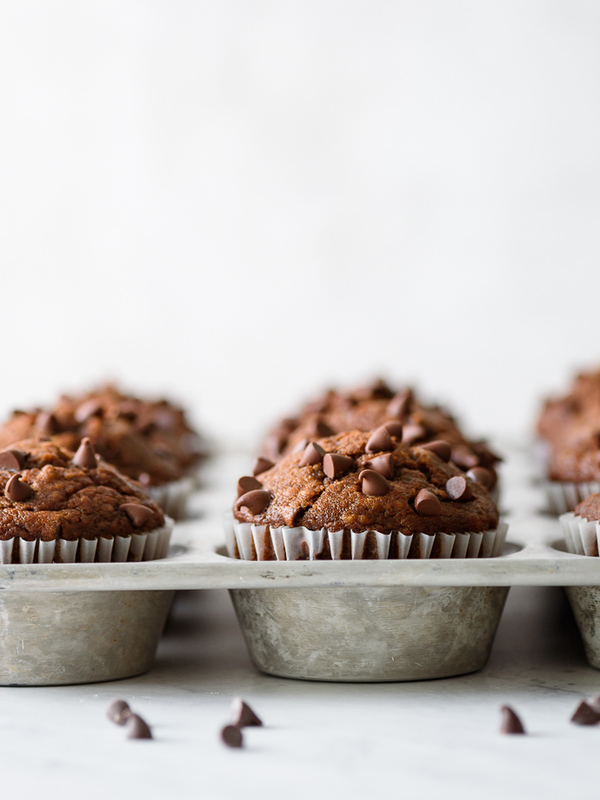 Despite the vegetable boost, like my mom’s pumpkin bread (which is sans-chocolate, and full of more traditional warming Fall spices), these muffins are more appropriate for dessert than healthy breakfast. Though I’m not above eating leftover pie for breakfast so take that with a grain of (flaky sea) salt. The virtues that we can agree on? The batter comes together quickly, in just one bowl, with no mixer required. 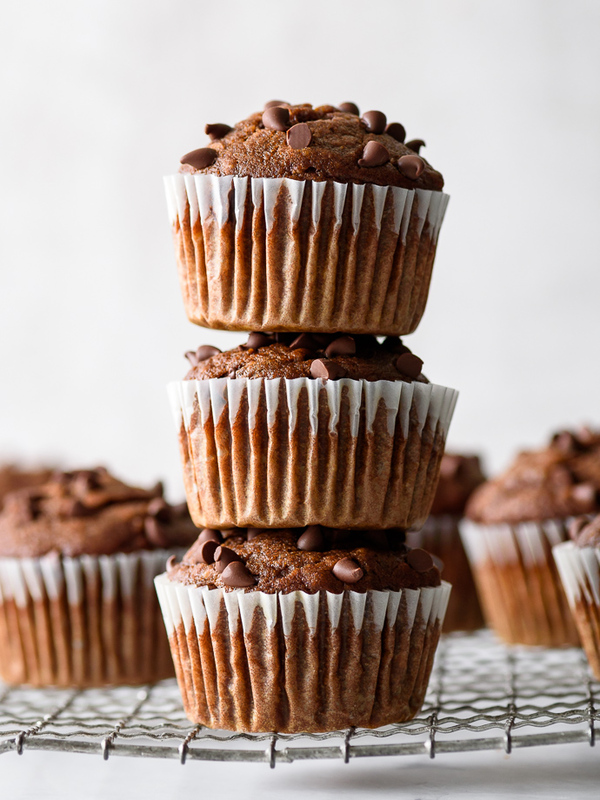 This recipe produces a satisfyingly exact dozen muffins, with perfect chocolate-chip studded domes, and tender, moist centers. You can taste the pumpkin, but the flavor isn’t overly sweet or cloying, as pumpkin spice can sometimes be. 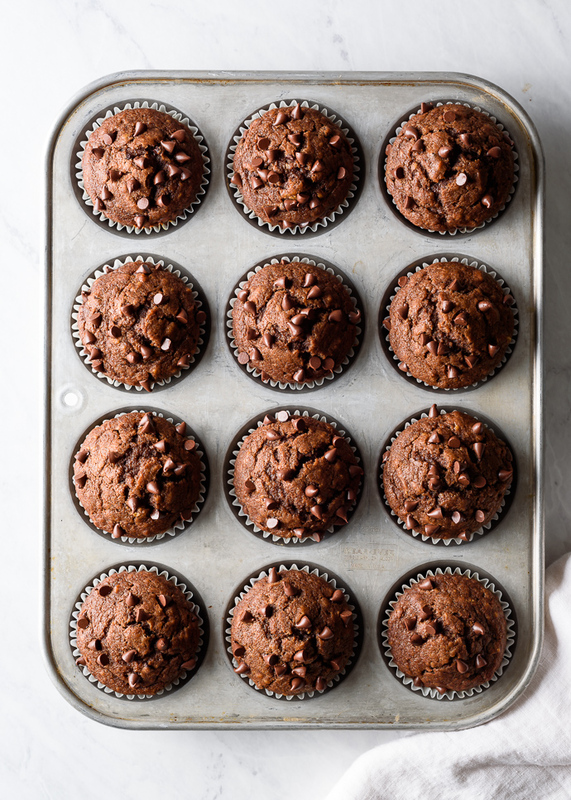 On the contrary, the pumpkin adds a depth of flavor to otherwise ordinary chocolate muffins that’s further highlighted by vanilla, brown sugar, and rich Dutch cocoa. Say hello to super chocolate-y, pumpkin spiced bliss! What’s your favorite way to use pumpkin? And let me know in the comments if there’s any pumpkin recipes you’d love to see me share on the blog this season! Preheat the oven to 375. Line a 12-cup muffin tin with paper liners or grease lightly with baking spray. Set aside. Whisk together the pumpkin, vanilla, and egg in a large mixing bowl until completely combined. Stir in the olive oil and milk. Add the sugars, and whisk until smooth. Using a spatula, stir in the cocoa powder, scraping down the sides of the bowl as necessary. Mix until the cocoa is completely incorporated. Stir in the salt and baking soda, then gently fold in the flour, until just combined and no streaks of flour remain. Be careful not to over mix. Use a cookie scoop to divide the batter among the prepared muffin cups, about 3/4 full. 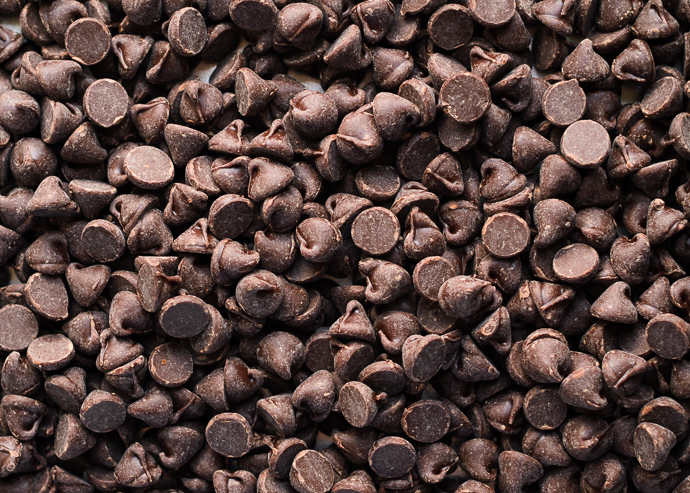 Sprinkle with the chocolate chips. Bake for 15-18 minutes, rotating once, until the muffin tops are nicely domed, and a cake-tester inserted into the center of the muffins comes out clean. Remove from the oven and let cool in the muffin tin for 5 minutes, before removing and cooling completely on a baking rack. Serve warm or at room-temperature. ¹ Look for plain canned pumpkin puree, not pumpkin pie filling. You can make your own by roasting a small sugar/pie pumpkin, but the consistency may be different than store bought. I use Libby’s. ² Use your milk of choice. I prefer unsweetened almond milk for this recipe. 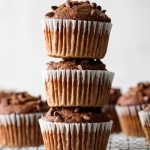 ³ I like Dutch cocoa powder in these muffins, but natural unsweetened cocoa will work too! These pumpkin recipes are the right amount of sweet and perfect for breakfast! I noticed that you described them as perfectly spiced, but do not see any spices in the ingredient list. Still the muffins were moist and the recipe is a keeper. Me too 🙂 Thanks, Laura!! I made these for Sunday breakfast and they were delicious! Everyone loved the mix of the chocolate and pumpkin flavors. I think I’ll make them again for Halloween, too — with orange frosting, and then sprinkle the mini chocolate chips on top of the frosting.